1991 and the years immediately following weren't a great time to be a fan of rock music featuring jangling guitars, pop hooks and an emphasis on melody. As grunge took over, much of the music world moved away from upbeat in favor of dark and moody. Thankfully for power pop lovers, there were a select few bands to push on against the grunge trend. Chicago’s own Material Issue – a three-piece made up of lead singer/guitarist Jim Ellison, bassist Ted Ansani and drummer Mike Zelenko - were perhaps the most notable. After three LPs, Ellison tragically took his life in 1996, putting an abrupt end to Material Issue. Though the charismatic frontman is no longer with us, Ansani and Zelenko have decided to celebrate the 20th anniversary of the band's debut album International Pop Overthrow by reviving their songs at the Abbey Pub on Saturday, April 23rd. Phil Angotti will step into the singer-guitarist role. In a recent interview with the Sun-Times, Ansani and Zelenko make it clear that the show isn't an attempt to replace Ellison, considering he was such an integral part of Material Issue. They have modified the band name to "Material Re-Issue" and do not have any plans to continue as a trio after the show. "Enough time has passed since Jim died that we feel, rather than it looking like we're somehow trying to ride on the coattails, that we're honoring and celebrating, not living off the past. We want to keep this a special thing," Ansani states in the article. 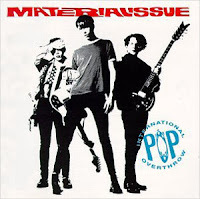 It might not be quite the real thing, but Material Re-Issue's Abbey gig should give the band's fans and power pop lovers in general a worthwhile opportunity to celebrate one of the genre's classic albums. Material Re-Issue will perform at the Abbey as part of the 2011 International Pop Overthrow, a multi-city, annual power pop festival named after Material Issue's debut. Also on the bill are Van Go, The Velvet Cadillacs, The Valley Downs, Johnny Monaco and Waiflike. $10 advance, $12 at the door, 21 and over. Tickets here. The show comes on the heels of a remastered and expanded reissue of the album.